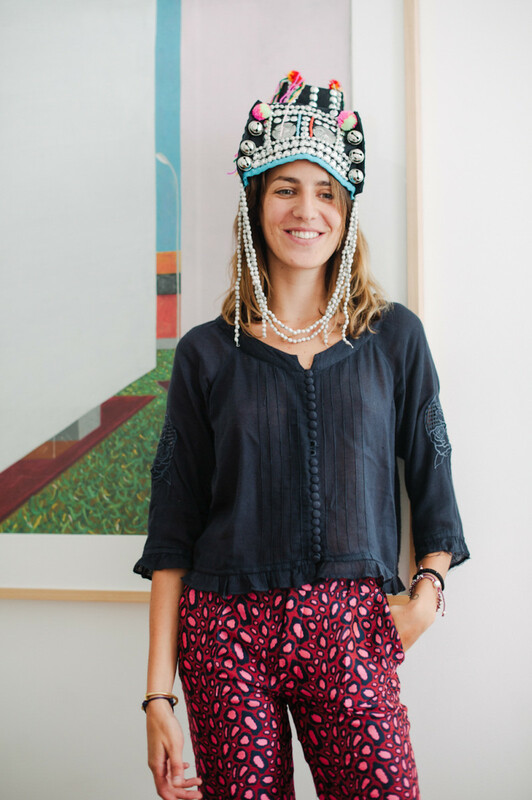 Coming from a family of art collectors, Carolina Pimenta lives in a light and, naturally, art-filled apartment in the Chiado neighborhood in central Lisbon. Much like the neighborhood, Carolina’s tastes tend to run towards traditional mixed with contemporary. She recently moved back here after spending a couple of years in New York and globetrotting from Bhutan to Brazil. Art and photography are her life. And traveling – she’s not the type to settle and becomes easily bored if she’s stuck in the same place for too long. When Carolina’s father, a dedicated collector, realized that he was running out of space in his home in Porto, he decided to fill the Lisbon flat with the Brazilian works in his collection. Carolina has mixed these with exotic items she’s picked up during her travels – creating a cozy space that reflects her venturesome life. It’s a sunny summer day in Lisbon, the city is relaxed and the people are friendly. Carolina says that in summer you can’t get anything done in Portugal, that’s how much people enjoy their summer – Carolina though, is on a roll. This portrait is part of our ongoing series with Vitra. 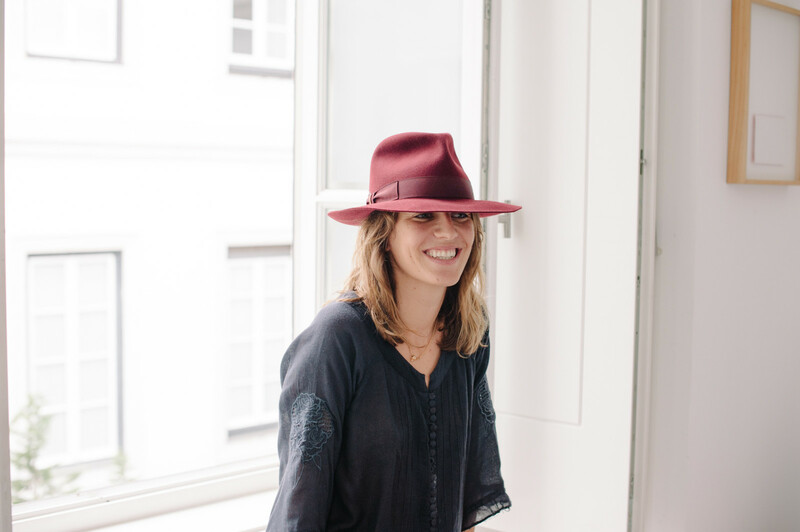 Visit Vitra Magazine to find out more about Carolina’s design pieces and the way she chooses to present them. What an amazing apartment. It’s new but you can sense history here. This building was originally property of the Dukes of Braganza and later during the 25 April Revolution in 1974 was the headquarters of PIDE, the International and State Defense Police. The building is embedded in one of the oldest neighborhoods of Lisbon and, although it has now been completely remodeled, it maintains some of its original traces. There is an eclectic crowd that lives here: from one of the most well established chefs in Portugal, to artists, politicians, designers – interesting neighbors, no doubt. Tell me more about yourself and the places you’ve lived. I’m from Porto, north of Portugal. I lived there until I was 18 and I went to an English school. Once I graduated I went to Lisbon for a year to take photography and painting courses. Then I moved to Leeds for university. There I did visual communications courses – photography, design, web design, video, animation. I also interned a lot. I started working for a Brazilian gallery and went to Art Basel and did their sales for a few years. Then I moved to London to intern for Mario Testino and I was with him for four months and that’s how I started getting into fashion and changing the roots of what I was doing. I got bored with London and England where it was grey. I went to visit a friend in Paris. She said, “I’m so bored with Paris.” I said, “I’m so bored with London. Let’s move to New York.” In two weeks we packed our stuff. I went home and told my parents: “Mom, Dad, I’m moving to New York.” I had some convincing to do, but then I was there for four years working. I started as an intern at Art Partner, which is a photo and production agency. In parallel I worked with a video production company, I ended up working there for a year. It was like military school, but also an amazing school of life. I learned so much. I quit because I felt I wanted to go more into the creative side and I started working for a boutique ad agency. I ended up becoming an assistant producer. We were only four girls and the owner, who was the creative director but we had huge clients like Nike. So we ended up being involved in everything. Did you get to travel much during your time in New York? I never had a contract because my thing is that I always need to travel and I need to see people and experience new things. I told my bosses: I don’t need a contract, I work as hard as I have to work and when there’s a gap between projects, I leave. I got to travel around a lot, between South America and the States and even to Europe, because I had that freedom. In parallel, I was always working on my photography and collages and I had a few shows in New York and then I joined this online gallery Create Collect and we did this big show in Miami. I went to Brazil for a month, Argentina, New York, then to Europe for two months, back to Miami for the show and finally to Asia. Where else did you travel to before you moved to Lisbon? Brazil, Argentina, Europe, India, Nepal, Bhutan, Thailand, Laos, Cambodia – I went with a friend that I lived with in New York. Actually that was quite funny, I needed a traveling buddy and she and I are awesome together. I didn’t want to do the trip alone and I used a lot of my friends to pose in my pictures, I don’t only like just landscape or the locals. So I first went to Brazil and when I got there she was working super hard and I could sense she wasn’t that happy with her job. I talked to her boyfriend and told him, “You know, she’s really not happy, she should come with me.” Then I talked to her brother and got her brother talk to her mother. While I was there I only told her how amazing my travels were going to be. Once I got back I sent her a huge email telling her, “I think you’re unhappy in your job, you’re an amazing person, I need you on my trip, you need to get out of this.” Luckily, I caught her, she said “I’m having the worst day in the office. You know what, I’m going to quit.” And she came. We had an amazing trip and now she has quite a few projects going on in Rio and she’s becoming this power woman, which I always knew she was going to be. Then I went to Mexico for a road trip – that’s my new exhibition and collaboration with another photographer, Anastasia Fugger. The show is going to be in New York, Munich, London and Lisbon. The fun thing behind the show and why we got galleries to take it on – we are two photographers, but at the same time, in the same location, doing the same shoots, but it’s not competitive. It was super collaborative. We have completely different work but you can tell we were in the same space and we flow together. Where did you meet her initially? She went to St. Andrews with my sister when I was in Leeds and Leeds was a shithole. So I spent two days in Leeds and the rest of the week at St. Andrews or London. Was the Mexico trip planned to create material for an art show? No. I disconnect and see what happens. Luck of the game, I usually put myself in situations, because I live a bit on the moon. I go and then I get into some random situation that I really shouldn’t be in and it always works out. You always end up meeting the right person to make it work out and it’s always an amazing story with amazing pictures. So far – so good. How long were you in Mexico? For a month and a bit. I have a lot of friends from Mexico so they told us where to go, we met up with them. A friend of mine, an insane performance actor, started doing full moon rituals. He started in Portugal, went to London, Rio and then he went to Mexico. We decided to meet up and do the ritual and I documented it. When I went back there after Mexico, it was a different vibe. I just didn’t want that buzz anymore. I needed nature. Here, I’m 20 minutes away from the beach. Lisbon is a bit more quiet. Three hours on the plane and I’m in London. I decided I needed this. I grew up in front of the sea in Porto. If you grow up on the sea, you start missing the power of the ocean. So you came back to Lisbon and decided, Hey, I’m going to stay? I was here for two months and I had so many friends visiting from Germany, France, England – and they didn’t know I was here. They sent me Facebook messages: “Caroline I’m going to Lisbon, can you give me some tips?” I said: “Actually, I’m here.” So I started to see all the motion that was going on. And I had this idea for a business and I thought: I can do it in New York and be one more and maybe succeed or I can be in Lisbon and be the only one and make it a powerhouse. So I decided to try and make it. That and Portugal is pretty incredible in the summer. How would you describe your photography work? The collages are quite dreamy. I tend to use places where I’ve been. I try to evoke emotion with them. Often I don’t do it consciously. I separate from it for a few months, later on I realize what it’s about. I did one that I sold to a friend of mine. He asked me, “Why did you do this?” And I did it maybe a year ago when my grandfather died. It’s a skull and around is my grandmother in her wedding dress and below is my uncle’s body – so months later I realized what was behind it. I don’t think beforehand about what I want to do and show. It flows and later on I reflect on it. Right now there is no typical day. It usually runs from waking up, getting on the computer, starting to work, then a friend will randomly call me because I’m new here, and they’ll say, “Look, I’m here with this dude and he wants to see your photography,” so I rush out and I show and sell. I have a lot of family that lives in Lisbon, so it’s been a bit hectic. There’s no routine, I can never count on anything, but it’s fun, things pop up. It’s chaotic but I love it. What’s a recent project you worked on? I do a lot of drawings for my collages. I do doodles. I’m busy with a massive one that will be in vinyl on a friend’s wall. I did three cars for Range Rover with these drawings and now Honda asked me to do it for them. They are called “actions” to get the cars noticed. I decorated the whole cars. I hope to do more things with these doodles. It’s quite funky. Let’s talk about Lisbon. What do you love about your neighborhood – Chiado? When I lived here eight years ago, before I left Portugal, I lived parallel to this street and the great thing about this area is that it’s downtown Lisbon. It’s beautiful, everyone comes here, because we have all the shops, restaurants and all the tourists. It’s the only place where I can live coming from New York and London, because it’s the place with the most movement. This place is quiet but when I leave the house and the block, I see different people. I see tourists, I see locals, I bump into friends. I can walk everywhere, I don’t need the car for much. You mentioned things changed a bit in Lisbon. I can also feel a real creative spark here – what kicked this off? I believe that the change in Lisbon in my generation was the Erasmus program. In the past few years a lot of people started going out of Lisbon and a lot of people are coming in. Lisbon is charming, you come once and fall in love. It has beautiful light, people are really nice. It’s the place, where you ask someone for directions and they’ll lead you to your destination. There’s great food here and it’s cheap. Also, there’s a lot of business from outsiders. I have friends from New York doing a shoe line here, another friend from New York is doing her hats here. People seemed to talk a lot about the financial crisis. The crisis hit us really fast. It was really depressing, people from my age, to my parents and grandparents age, all they would talk about was the crisis. And now people are enjoying life again – things are picking up. So people are experimenting again? You can find good hand labor here. For textiles, for shoes, for wood. Artisanal quality. It’s bringing in a lot of young businesses, their base isn’t usually here but their products get made here. You can really see that you and your parents are crazy about art. My parents are super cool. They’re young and we’re very close. We talk about everything – there are no taboos. My dad is from Porto, my mom from Lisbon. They met in London and then they got married and moved back to Portugal. My dad is a crazy art collector and my mother also loves art. So since we were children, we’ve lived with art and had artists in the house. Most collectors that I see and know from the galleries, have a very standoffish relationship with artists. Artists usually don’t like collectors but the collectors want to know artists. But my dad became friends with many artists. It’s pure interest, he doesn’t collect for money, he collects because he is obsessed with the artists and loves it so much. Artists come to our house and chill there for a week and we go see them at their houses and visit them, it’s a pleasure. They are not doing him the favor of meeting with him because they know he’s going to buy. Since we were young, my parents made my sister and I sit at the table and listen to the conversations, as you grow you start to understand and become amazed. It’s not a common experience. Tell me more about the artworks in the house. There are loads of artworks in the house. When we moved in, these big pieces wouldn’t fit in the elevator or through the staircase. Down here, it’s a one-way street with a tram. For a few hours in the morning there was a huge crane blocking the whole street to get the artworks in. My dad collects art and he made this apartment just Brazilian works. Tunga who’s incredible. Vik Muniz, he’s pretty known. Miguel Rio Branco, who’s one of my favorite Brazilian photographers. The TV is a Marepe, it moves up and down if you connect it to electricity. That was actually a present to my sister who used to work for the Luisa Strina gallery. Cildo Meireles – for me he is the best Brazilian artist. His mind is incredible and his work is fantastic. He’s a very political artist. I think that’s why Brazilian artists are so good it’s because you have such a clash of cultures. There’s a lot of tension in the art. 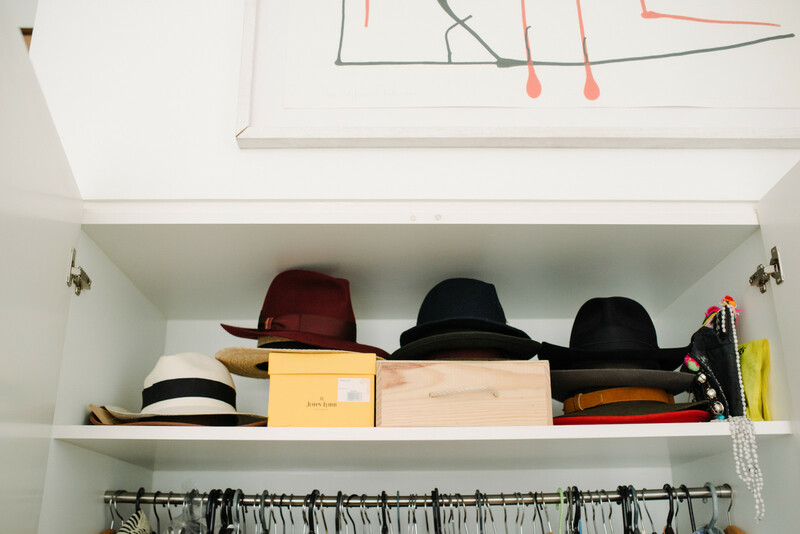 You also collect hats – when did you start? Years ago. My grandfather gave me a hunting hat and I loved it. I have frizzy hair so it works well. I became obsessed with hats. Then I started collecting whips from Arizona, I thought it was fun and then I started noticing them. I got some from India, a silver one with beads. And I’m a horse rider. I mainly go south to the beaches. Even if I stay, I cross the bridge and I’m at an incredible beach. What are some of your favorite spots and shops in the city? I’m kind of a neighborhood girl, I tend to stay here. I go a lot to Esperanca pizzeria, it’s owned by a friend of mine. Really good pizza and amazing bread sticks, I have them with olive oil and salt. I go a lot to Tartine for brunch and breakfast. There’s amazing ice cream at Santini. Up the road we have all these new shops in old buildings from design to shoes to sunglasses to dresses from young brands and young designers from Portugal and elsewhere. Lux is really good to go out at night, it’s a super cool club. It used to be owned by John Malkovich. Every good DJ comes to play, it has three floors and super funky design. Where should people go if they want to see more of your work? If you want to know me, you have to see my blog through my website. That’s where I put all my inspiration. It’s my online diary. Carolina, that was a great discussion and seeing all your special bits and bobs in your space was really inspiring. Meet more creatives in Lisbon and have a look at how other FvF guests showcase Vitra furniture in their environment with a personal touch.